As I entered the long narrow refrigerator at Three Stone Hearth, I scanned walls of shelves, lined with innumerable jars containing various broths, stews and spreads. As a devoted fan of glass jars (I even have one tattooed on my arm), I was looking forward to learning more about Three Stone Hearth’s commitment to local, organic, nutrient-dense, sustainably-sourced and packaged foodstuffs. The Berkeley-based business has developed a unique model for community-scale food preparation and processing that provides a weekly menu of readymade food items for pickup or delivery. “The Mayans cooked their food on a three stone hearth,” Prentice explained, “which is the most universal hearth form on the planet with three stones surrounding a fire.” This tool was not only used to nourish the bodies of the Mayans, but also existed in their spirit world of the night sky where the stars told their sacred story of creation. Three Stone Hearth, located at University Avenue in Berkeley, wears an imprint of the ancient Mayan oven as its logo to honor the sacredness of food and the significance of tradition. Prentice also explained how the three “hearthstones” support the worker-owned cooperative business. 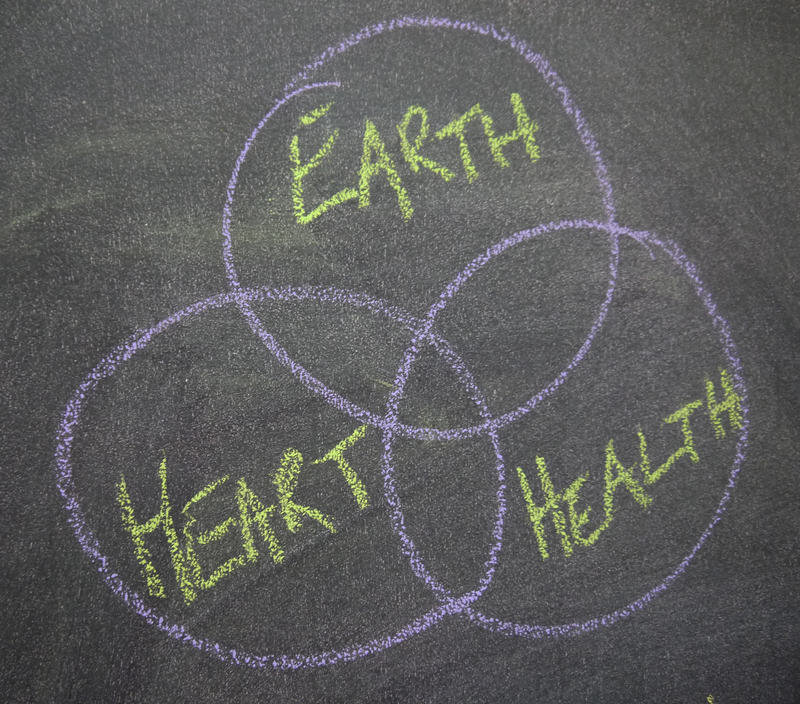 She drew a three-circled Venn diagram on a blackboard and labeled the circles: earth, health and heart. “Under the value of earth lies the business’s sourcing of ingredients,” Prentice told us.” The kitchen makes signature, nutrient-dense, seasonal and freshly prepared foods, such as lentil chili with lamb, cultured gazpacho and cilantro-scallion pesto. Their menu changes weekly but always includes foods in the categories of “meat,” “do-it-yourself” and a “seasonal” section. Three Stone Hearth is committed to using the most ecologically sound ingredients possible, from organic fruits and vegetable to pasture-raised meat (organic when possible). “The business invests in building a local food system by working with farmers over the long term,” said Prentice. For example, Three Stone Hearth paid a local farm extra money to raise a special group of organic and free-range chickens just for them. Another element of their “earth” pillar is packaging. 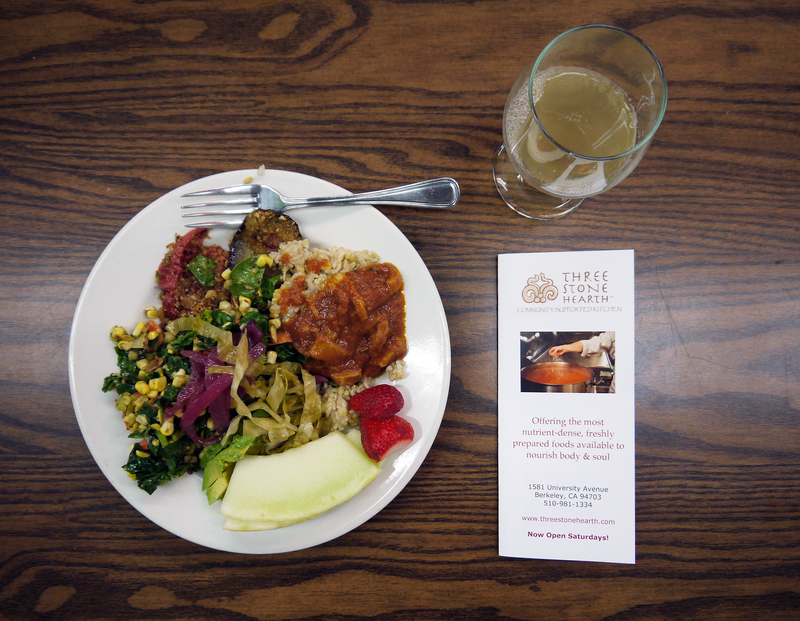 Three Stone Hearth makes prepared food for a diverse range of customers. Prentice specifies, “From parents with small children, people dealing with illness, the super-conscious--who are spiritually, economically and ecologically aware--and the just plain busy.” For a jar-lover like myself, Three Stone Hearth is a cylindrical glass heaven, they use reusable glass jars to package almost all of their food. 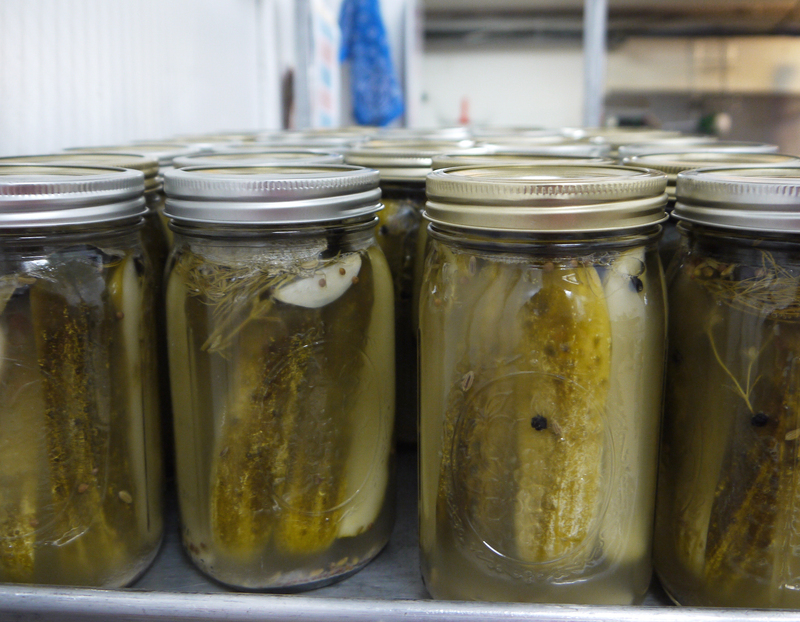 Instead of having disposable plastic containers, they supply jars to their local kale-chip-maker and seaweed-harvester for their products sold in the store portion of Three Stone Hearth. "Health" is Three Stone Hearth’s second core value. The kitchen’s philosophy and menu is largely based on the work of Weston Price, a dentist, who saw the teeth as a window into health. In the 1930s, Price traveled the world from Polynesia to Africa and Australia examining the teeth of Native communities who still ate traditional diets. He found that when people consumed their ancestral foods their wellness thrived and their dental health was exceptional. But when missionaries arrived and introduced a more Western diet, Price observed that in less than a year, the indigenous people’s teeth started to get cavities and fall out. He believed that the “foods of modern commerce” (including refined sugar, white flour, vegetable oils and canned goods) displaced the traditional nutrient-dense foods and wreaked havoc on people’s health. Sally Fallon, the president of the Weston A. 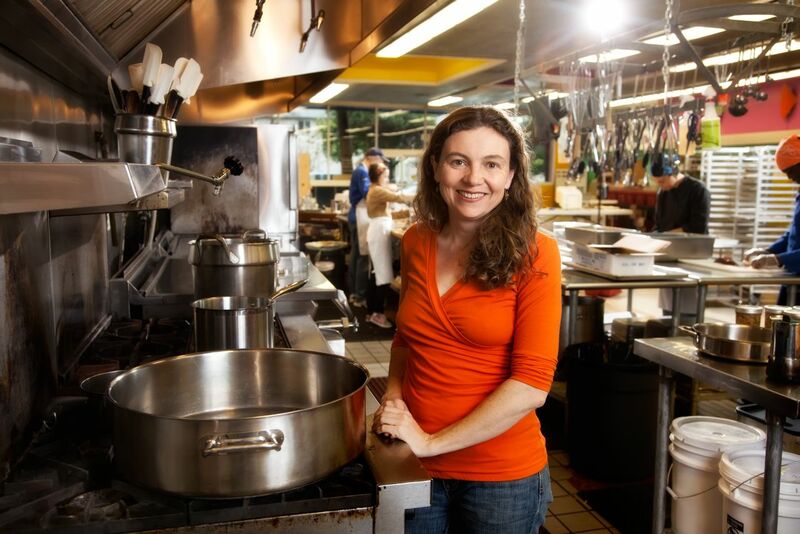 Price Foundation, is the author of Nourishing Traditions, the cookbook that she based on her own and Price’s research. Three Stone Hearth is rooted in the stance that our current food system is destroying human health and that we have much to learn from our ancestors. Three Stone Hearth’s kitchen embraces the qualities of traditional diets in every dish. From their numerous fermented foods: kombucha, kefir, sauerkraut, kimchi and pickles to their use of all parts of the animal through paté, bone broth, stews and meatballs. If you want to take some traditional food knowledge to-go you can purchase a copy of Prentice cookbook’s Full Moon Harvest, that follows the 13 lunar cycles of the agrarian year to dish out her wisdom. The final hearthstone supporting the Berkeley business is "heart." 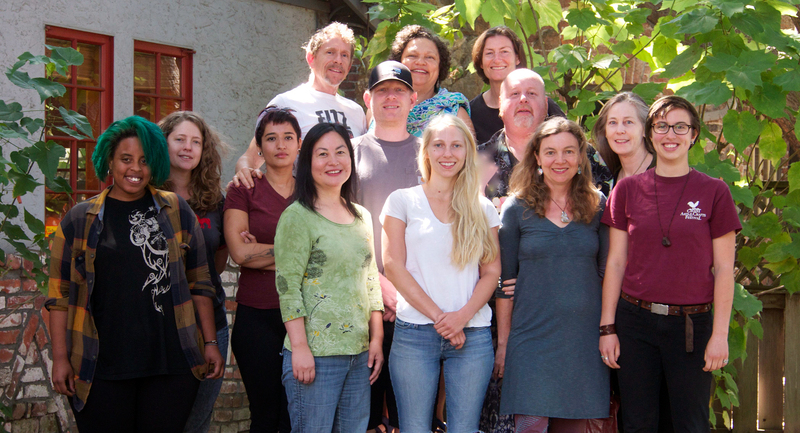 Three Stone Hearth is a worker-owned cooperative with 14 worker-owners and 28 full and part-time paid employees. Customers know that each bite of beef stew that they enjoy is not only nutrient dense but filled with love. Customers and workers interact like family and Prentice takes customer feedback seriously. She also speaks to the importance of distribution of power, authority and capital close to the labor. Three Stone Hearth runs on a Holacratic system, which removes power from a management hierarchy and distributes it across clear roles. Staff is given space to be creative and follow their passions, which then benefit the entire community. One way I got to experience the kitchen staff’s culture was by helping prepare an elaborate lunch. The staff eats lunch together everyday, which allows everyone to slow down and appreciate the fruits of their labor. We sat down with a bubbly glass of kombucha and a plate full of breaded eggplant, sauerkraut, rice topped with tripe (I never thought that I’d put that in my mouth and exclaim how good it was), salad and fruit. Just like the glass jars they use to house their delicious food, Three Stone Hearth values transparency. Prentice explained that the transparency of their business is a driving force behind their classes along with their desire to bring the community together to explore the sacredness of food.